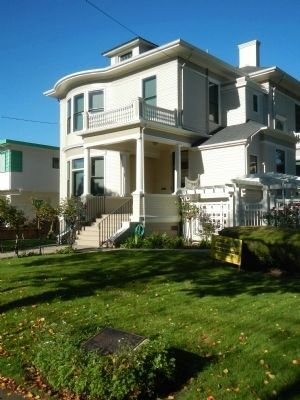 The Meyers House was erected in 1897. 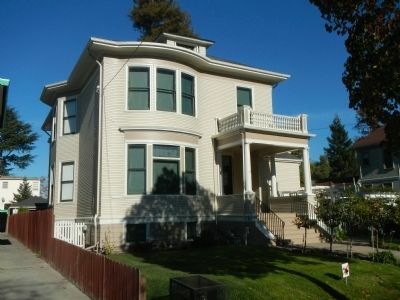 This Colonial Revival style home was designed by and built for prominent East Bay architect Henry H. Meyers. It served as the family residence from 1897 to 1993. 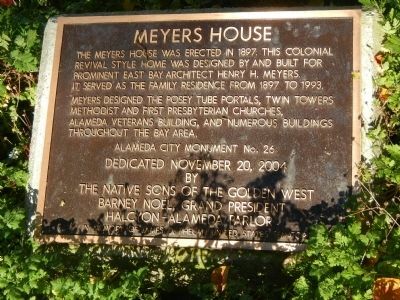 Meyers designed the Posey Tunnel Portals, Twin Towers Methodist and First Presbyterian Churches, Alameda Veterans Building, and numerous buildings throughout the Bay Area. Location. 37° 46.037′ N, 122° 15.139′ W. Marker is in Alameda, California, in Alameda County. Marker is on Alameda Avenue near Chestnut Street, on the right when traveling west. Touch for map. Marker is at or near this postal address: 2021 Alameda Avenue, Alameda CA 94501, United States of America. Touch for directions. (approx. 0.4 miles away); Alameda Lodge No. 1015 (approx. half a mile away); Alameda’s First Church (approx. half a mile away); Alameda City Hall, 1895-96 (approx. half a mile away); a different marker also named Alameda City Hall (approx. half a mile away); Clark Memorial Bench (approx. 0.7 miles away). Touch for a list and map of all markers in Alameda. More. Search the internet for Meyers House. Credits. This page was last revised on June 16, 2016. This page originally submitted on December 23, 2014, by Barry Swackhamer of San Jose, California. This page has been viewed 320 times since then and 10 times this year. Photos: 1, 2, 3. submitted on December 23, 2014, by Barry Swackhamer of San Jose, California. • Syd Whittle was the editor who published this page.